DGI Mailer comes with more than 100 professionally designed templates that can be customised to match your company’s branding. All templates are tested throughout all email clients to ensure that they render correctly in each inbox. The DGI Mailer WYSIWYG editor has been constructed with the user in mind. With a familiar looking layout and with every function only a click away, it allows even HTML novices to construct professional email marketing campaigns. Have customers sign up to your DGI Mailer subscriber lists through your website with the aid of the website form creation wizard. Follow the on-screen step-by-step guide, paste in the generated html onto your site and you’re ready to go. Personalise your email campaign as much as you want by creating unlimited custom fields. You can also set up surveys and data collection pages to revolutionise your market research collection. We understand that users may not want to create their emails within DGI Mailer. To cater for this, there are three different ways to create your template: WYSIWYG, upload file or import from web site. DGI Mailer allows you to create HTML, plain text, or send as multi-part to improve your chances of reaching your recipients. Multi-part will actually send a copy of both messages and the recipients mail server decides which to accept. Keep your images stored on DGI Mailer’s server with the image upload function then just use the WYSIWYG editor to insert or modify each image in your email marketing campaign. Creating a customised campaign couldn't be easier with DGI Mailer’s quick link buttons. Use them to create unsubscribe links, forward to a friend links, or add personalised details about your customers. Auto Spam checker will filter through your email to pick up on words that are commonly blocked in spam filters. Make sure your email is rendering properly in the main webmail and email inboxes by using DGI Mailer's inbox viewer. Improve your deliverability with DGI Mailer’s multi-part creator. Just write your HTML email campaign, click a button and see the text version instantly created. DGI Mailer allows you to create contact lists to import your contacts to. While creating the actual list itself it will allow you specify which email address you want the campaign to appear from and also select the reply address as well. 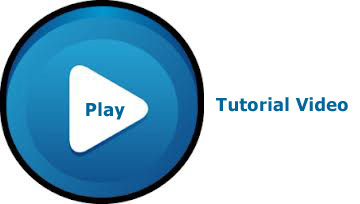 Type in contacts details one by one, or even import existing contacts from Microsoft Excel, Outlook or a CSV file. All most all database and CRM packages allow to export your contacts as a CSV file so you can easily upload your contact list to DGI Mailer. Use DGI Mailer’s in-built website forms tool to create subscription forms to place on your website, and effortlessly collect both existing and potential customers’ addresses to significantly boost the power of your email marketing strategy. The code DGI Mailer generates is open-source, enabling it to be customised in web design applications. This allows you to truly personalise it and make it your own. Create as many contact lists as you need, allowing you to group contacts based on type or lead source, such as "newsletter subscribers" and "sales leads". You can then send to individual lists or multiple list depending on the requirements of each campaign. Remove large groups of contacts from your list by typing in their email addresses or uploading a file. You can remove contacts permanently or mark them as unsubscribed so they won't receive any new emails you send out. The built-in email suppression tool allows you to keep lists a list of contacts who shouldn't (and won't) be sent your emails under any circumstance. You can enter a particular email address or an entire domain if required. DGI Mailer boasts advanced unsubscribe features. One-click or two-click unsubscribe options lets subscribers choose what they receive from you, this means you can give them exactly what they want. DGI Mailer will automatically manage any bounced emails in the background for you. It will label them as a hard or soft bounce and even give the reason why. 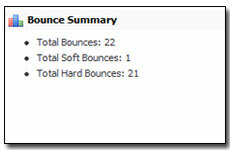 Hard bounces are not deleted from your list but DGI Mailer will not attempt to send to them again. DGI Mailer will automatically create an archive of all your campaigns. You can select what campaigns you want included in the archive, and by using a simple RSS feed, this archive can be integrated with your web site to automatically create pages of fresh content for you. If your CRM (Customer Relationship Management) or existing systems allow, you can integrate your database with our user API (Application Programming Interface). This will allow you to update in DGI Mailer in real time. For example, when a new lead is entered into your CRM (Customer Relationship Management), a background process will automatically add that user to your DGI Mailer database. The DGI Mailer servers are designed with mass email-sending in mind. We can send thousands of emails at a time without a problem. No system crashing, no part mails sent, no duplicate sending. Every campaign you produce and send will reach its intended target. Want to send a campaign when you’re not in the office? DGI Mailer has a campaign scheduling function that will allow you to set up as many campaigns in the future as you wish. You can choose the date and time you wish the campaigns to go. DGI Mailer boasts advanced unsubscribe features. One-click or two-click unsubscribe options lets subscribers choose what they receive from you; this means you can give them exactly what they want. Improve your SEO (Search Engine Optimisation) ranking by publishing your previous email campaigns as an RSS feed on your site. DGI Mailer has an in-built function that can help in converting previous campaigns to an RSS feed. Set up a series of autoresponders to send to each new subscriber to your list. Have them timed to your specification so you can maintain the same high level of interest in your company. Increase the accuracy of your promotional campaigns by setting autoresponders to send only to people who have opened previous campaigns or clicked on a certain link. DGI Mailer can use the previous statistics to start your own multi-level email marketing campaign. DGI Mailer’s improved multi-preview function will enable you to preview your campaign by sending emails to your colleagues, without affecting your sending credit. DGI Mailer has an in-depth reporting system that allows you to look at the overall effectiveness of your email marketing campaign. Look at open rates, link click-throughs, and even look at who has clicked where and which areas were most popular in the campaign. DGI Mailer's reporting system doesn't just tell you whether an email has bounced; it will tell you why it bounced. Whether an invalid address or blocked due to content, the report will allow you to view the results and help you fine-tune future campaigns. 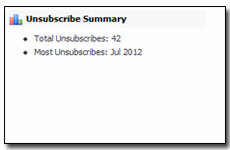 DGI Mailer will give you statistics on any unsubscribes your campaign receives. You can see who has unsubscribed and the time and date as well. 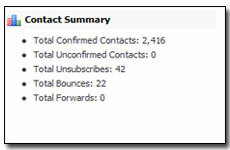 DGI Mailer also allows you view statistics on individual contact lists. You can view who has subscribed and when. It also gives you open stats, click thru stats, bounce and unsubscribe statistics as well. Check how your campaigns are progressing by viewing your archived campaign statistics. View your previous results then construct future campaigns on what you've found. DGI Mailer now has a built in drag and drop feature that allows to create survey forms to host on your website. When the forms are completed by the website visitor all the information they provide is sent back to DGI Mailer where you can view and export that information. 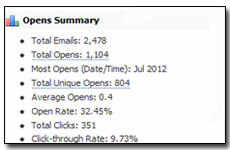 View the success of your autoresponder campaigns as well as your email campaigns. Use the data to form future campaigns. View open rates, click-thrus and even look at individual recipient's data. DGI Mailer can be integrated into your Google analytics account to view exactly where the recipients go after leaving your newsletter. 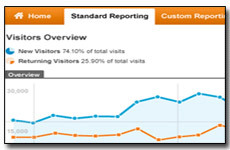 View conversion rates and calculate ROI (Return On Investment) with minimum effort. Email deliverability is essentially getting your email campaigns accepted by your targets’ servers. When an email campaign is sent out, the email will queue at your recipients’ servers until a spam filtering system decides whether to deliver the email to its intended recipient or reject the delivery. Avoiding spam filters is the part in which we play a major role, and the reason you choose to use our service over any other available Email Service Provider. We will not allow companies to use rented or purchased third-party lists – even if they are opt-in and legal. Use of these lists is one of the main causes of spam complaints. By not allowing purchased lists into the system, we manage to prevent a considerably large proportion of those complaints from reaching us. For us, SPAM isn’t about legality; it’s about sending relevant emails to your subscribers and customers. For more information on this, please view our anti-spam policy. Authentication has been brought in to place to allow legitimate senders to send their emails with greater success. Though there are different authentication methods out there, they essentially have the same goals – to validate the mail that is being sent out as an authentic mail from the sending company. The intention of this is to stop spammers sending spoof emails claiming to be from a sender, when in reality they are just trying to collect credit card numbers, passwords etc. With authentication procedures in place, you not only increase the legitimacy (and deliverability) of your own commercial emails, but also discredit and considerably decrease the effectiveness of any spammer trying to send emails and claiming to be you. There are a number of different authentication methods available to the sender – some are easy to implement whilst others are a little harder. Some are inserted in to the sending server’s IP, whilst others are embedded into the headers of the emails that are sent out. With DGI Mailer’s authentication service, this will all be done on your behalf, so you can be assured that your company will benefit from the highest level of deliverability. Our IP’s addresses and reputations are constantly monitored to ensure that the accepted rate stays at a high level. There are several factors that can affect an IP’s address acceptance rate. Complaint levels, sending consistency, authentication and server reputation are amongst some of the criteria that give the general accepted rate score for our IP addresses. We have procedures in place that cover all of these factors and allow our senders to enjoy the best deliverability rates. There will be occasions when someone may slip through the net or make a mistake, something that may cause a blacklisting or severe drop in deliverability (It happens to everyone at some point in time). DGI Mailer has procedures in place that ensure that if something like this happens, you the customer won’t be affected by this problem. We own a number of different IP ranges that we can switch you to whilst the blacklisting situation is resolved so that our service to you isn’t interrupted. For companies that wish to avoid shared IP addresses completely, we also offer a dedicated IP service at an additional monthly fee. We have feedback loops set up with ISPs to allow anyone who receives an email originating from our servers to post feedback regarding the legitimacy of the email. This allows us to monitor our senders’ habits and make sure that no one is spoiling it for everyone else. By doing this, we can remove any sender who exceeds our tight complaint-level limits, and allow our legitimate, relevant senders to continue to have their emails sent without adverse reactions. This also shows to the ISPs that our IP addresses are considerate senders of legitimate emails, which in turn improves our servers’ sending reputation; once again increasing our overall email deliverability. We run a sending consistency policy on our IP ranges where users with similar sending habits to your own company will be grouped together. We do this so that our customers can all benefit from being on an IP range that despatches all emails sent on a similar basis. The reason we do this is because ISPs like to see a consistent stream of emails being sent to them. If all of a sudden, an out-of-the-ordinary amount of emails arrives from an originating server, it can be classed as a spam attack by the ISPs who subsequently drop deliverability rates. By having this policy in place, we minimise the risk of this happening to our IP addresses. This is defined as not only getting your emails accepted, but also having them delivered to the recipient’s inbox. Unlike email deliverability, this isn’t something we can do through bulk settings and procedures, but instead comes down to individual accounts and email campaigns. We do however provide guidance, support and services to help each and every customer understand what it takes to achieve inbox deliverability.